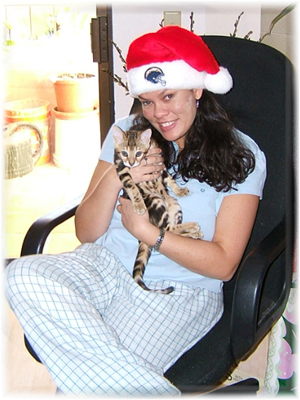 I, Maria, am a Clinical Psychologist and my husband, Richard, is a computer programmer. 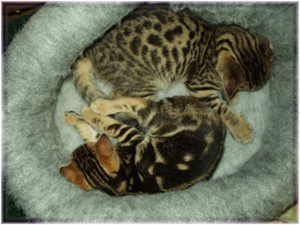 We started our cattery after falling in love with our Bengal pets. We loved everything about the breed and wanted to help perfect it even further. My husband and I are committed to everything we do. Our cattery is no different. Our bengals are given much love and attention, and our flexible schedules allow us to pamper our royal babies at all times. Our cats are indoor cats, but are frequently taken to the park to experience the outside world safely-on a harness with us present at all times. We do this for several reasons: get them adjusted to riding in the car, help them associate riding in the car with more pleasant experiences (i.e., play vs. vet), and to increase their confidence in different situations via exposing them to various sounds and people. 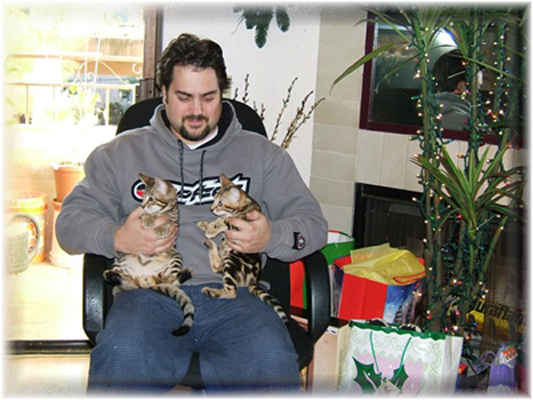 Our future kitties will be well socialized and ready to travel with you anywhere, if you so wish. We are in the developing stages of our cattery. We plan on keeping our cattery small so we can devote all of our attention to one litter at a time. Our goal is to breed kittens with sweet personalities and the look of the wild. Our queens are a big part of our family. They dominates our home and are literally treated like royalty. We are currently in search of the perfect stud to breed with our Queens. Health and temperament are obviously a priority. But in addition to those essential qualities, we are also looking for a stud with a wild head, and a silky coat with great contrast and horizontal flow. Given that our queens have an excellent profile and wild heads a clear coated, wild-looking male should help accentuate these wonderful characteristics in their offspring. We will keep you posted of our findings.